When we started planning a visit and project in Detroit earlier this year, we had only a few rough ideas of what to expect—and we ended up with every expectation challenged. We went to help, and ended up learning more than teaching. We want to keep working with our new friends and collaborators there, and we are continuing to discuss how and when to do this. We looked more like a rock band than a band of innovators as we hustled into the large shiny black SUV. White, black, Asian, short, tall, casually dressed, it was all there–the only things missing were guitars, amps, a bass, and a dope lead vocalist. But we were no band–in fact we had yet to band together around the task at hand–and in essence this ﬁrst ride through the gritty streets of Detroit would be our feeling-out period. We were getting to know each other against the backdrop of a city that had been labeled the rust belt capital or murder capital of the world depending on who was telling the story. I felt a great deal of responsibility as an ambassador of Detroit. I knew that I had to show the complexities of Detroit if we were to succeed in our efforts as innovators. I didn’t want anyone to come away from IG Detroit with an unrealistic, romanticized idea of the challenges we face. As we made our way down Grand River Avenue, the stark contrast of poverty-entrenched communities that were only a few blocks away from wealthy enclaves was evident. By highlighting these contradictions I felt that the team members would be better equipped to understand how to approach the design challenges. We drove block after burned out block and I watched the varied expressions of my passengers through the rear-view mirror. They ranged from disbelief and sadness, to intrigue and hopefulness. In my own eyes I saw a tinge of embarrassment for our city, for the people who call Detroit home, including myself. For the ﬁrst time in a long time I looked at Detroit objectively, and it was painful to digest what was happening to my beloved city. However the pain was soothed by thoughts of what was underway. As we traveled around Detroit, I felt compelled to give a voice to the societal fractures all around us, but where was I to begin? How could I sum up the tearing asunder of a city that at one time was a place of pride and joy? There was no easy answer and the gravity of it bore down on me. So instead, I simply said there is so much hope and potential here, and it was these simple words that set the tone for what I hoped IG Detroit would mean for that weekend. Though we had yet to sit down in our work space, I could see the wheels of innovation starting to spin. We worked in small groups dispersed throughout OmniCorp, located in the heart of Detroit’s Eastern Market. 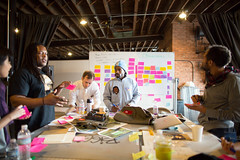 Each group had its own space to iterate on ideas that were shared at the inception of IG Detroit, but we all checked in on each other from time to time. We genuinely enjoyed each other’s company and had a blast each night when we wound down from our work day. When it was time to conclude our weekend and share our projects I had mixed feelings. On the one hand, I was very excited to see what innovations the other teams came up with, but on the other hand, I was a bit saddened that our weekend was coming to an end. I had made friends with people who I believe will be a part of my life for years to come. I had laughed and joked with designer Christopher Bevans and shared soul food with Haiyan Zhang and Erhardt Graeff. 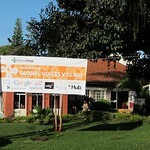 In addition to innovating we were creating a human experience that will have a lasting impact for years to come. After we presented in front of the other groups and people from different areas of Detroit, I took time to talk to those in attendance to get a feel for what they thought. From what I gathered from talking with people who showed up on the ﬁnal day, there is a great deal of hope and optimism about the future of IG Detroit. I could even sense from those who were cynical in the beginning that they were impressed by what we were able to accomplish in a relatively short amount of time. 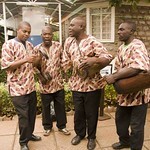 They were excited by our work and showed interest in working with us moving forward. It was a good sign that we are on the right path and I am looking forward to the next phase of IG Detroit. IG Detroit was supported by a grant from Knight Foundation. 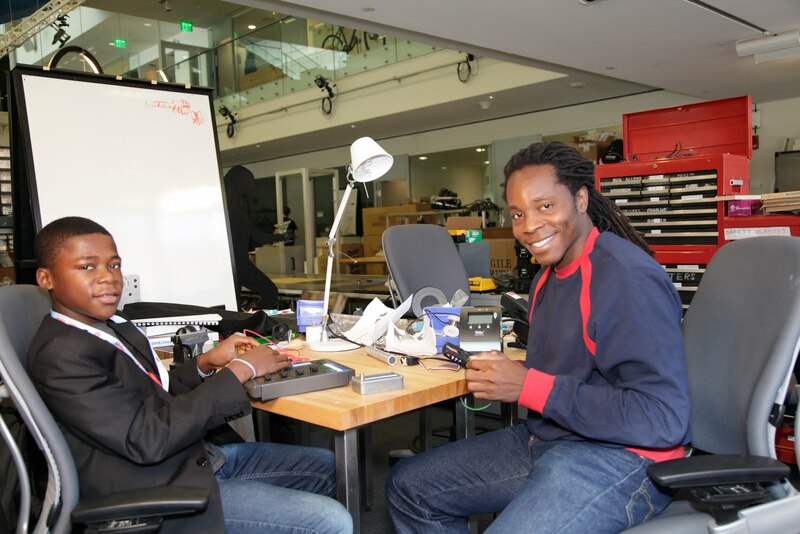 At the Media Lab, PhD candidate David Sengeh is helping to change the world by developing next-generation smart prostheses. But this self-professed technology geek is also making an impact halfway around the world in his native Sierra Leone, where he’s launched Innovate Salone, a national high-school innovation challenge. Innovate Salone is funded by Global Minimum Inc.. “The idea,” says David, “is to encourage the country’s students to use their own ingenuity to solve some of their country’s most challenging problems–to lay the bedrock for national development.” The focus is on issues related to health, energy, education, agriculture, transportation, telecommunications, civic media, and engineering. Read what David says about the project on CNN. [Update: here's another article, with a great video of David and Kelvin working at the Media Lab.] Interested in becoming a sponsors or donor? Send email to info@gmin.org. Is it even possible to describe the beautiful maelstrom of joy and creativity we experienced at the Mozilla Festival last weekend? Three days of learning, design, and making across nine floors at Ravensbourne University left me feeling like I had fallen into a ball pit overflowing with magic beans from Jack and the Giant Beanstalk. Creative ideas were growing fast in all directions. At the same time, the festival offered fascinating insights into how Mozilla facilitates their amazing community energy around transformational change towards an open Internet of makers. Eric Rosenbaum held a workshop on MaKey MaKey. Ravensbourne student Selcuk Cura has uploaded videos of what people created ( 1, 2, 3, 4, 5, 6). The Mozilla Festival also brings together a community of bloggers, journalists, and documentary film-makers to share idea and collaborate. 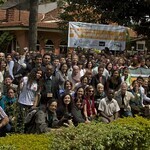 I facilitated an amazing conversation of journalists, film-makers, coders, and activists on citizen video. Check out the extensive notes and links on the Civic Media blog: Curating and Repackaging Citizen Video for the News at #MozFest. The Knight Foundation, who funds the Center for Civic Media, announced the 2013 Knight-Mozilla Open News Fellows and discussed new directions for Knight's grantmaking in digital innovation for the news. During the festival, I enjoyed liveblogging with the Mozilla team, finding out what young people made during the festival, and documenting Joi's keynote on Sunday. The high point for me was an amazing team effort with Matt, Rebecca, Paul and others to photograph and document every project during the festival's closing Demo Party. Inspiring! I want to especially thank Gunner and Michelle Thorne for running a truly wonderful event, and for offering ongoing, supportive advice on how to facilitate great sessions. Mozilla is one of the organizations I point to when I talk about what it means to be a network and a platform rather than just an institution. To illustrate what I mean, consider the story of PopcornMaker, a video editor for the open web. 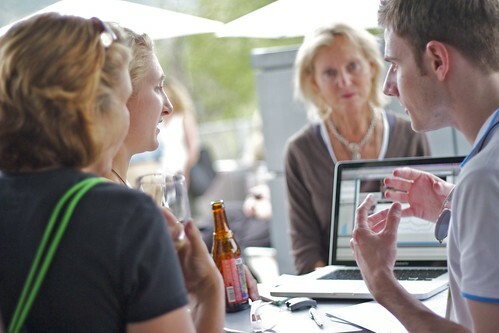 Networked organizations facilitate moments for innovation to arrive from the edges to meet the inspiration and connections to succeed. At #MozFest 2011, the popcorn.js developers found film-making partners to develop projects like One Millionth Tower. Networked organizations offer innovators the structure they need to build and ship good products. In addition to connections, Mozilla supported Popcorn through bug tracking, a release schedule, and publicity to turn a great idea into a solid technology. Platforms turn great hacks into visionary, transformational paradigms. Popcorn.js was a library for software developers. By creating PopcornMaker, Mozilla is extending its vision for an open, writeable web to video online for anyone. As a grad student at the Media Lab, where Joi is re-imagining the Lab as a network, I'm excited to share inspiration and collaboration with such an amazing community. In all the creative unpredictability of the #MozFest's bag of magic beans, I think we're going to see some very tall trees grow. J. Nathan Matias is a graduate student researching media consumption, creative learning, and community co-design at the Center for Civic Media. This post by Media Lab Director Joi Ito originally ran on LinkedIn's Thought Leaders blog. What do you get when you have a massive storm approaching, a bunch of MIT Media Lab hackers with the next day off stuck in their rooms waiting for the power to go out? You get #hurricanehackers of course. We learned a lot about this during the Safecast launch after the 3/11 earthquake in Japan, and are seeing it now with #hurricanehackers. One of the most important principles of what we do at the Media Lab is "practice over theory" or "just build it". It's a very effective principle in rapid response to natural disasters and other things where the ability to "pull" from the network and collaborate quickly and effectively are essential. One of the key elements is to make sure that you use all of the effective tools for collaboration and communication so that you don't duplicate efforts and you quickly aggregate and pull people together. Most of the obvious ideas get started by everyone and trying to find unique ideas while pulling together parallel projects is key. One thing we quickly learned is that tools like Google docs and etherpad with their limit on the total number of participants were inadequate for the scale of collaboration we need. We ended up on Internet Relay Chat (IRC), the pre-Web text chat protocol that survives today as one of the primary modes of communication among hackers. 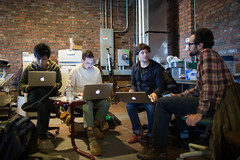 We'll be hosting one of the number of CrisisCamps this weekend at the Media Lab. Please tune in or participate if you have time. We'll roll out more details about each team's work over the next few weeks, but here's a preview. Within a few hours of beginning our challenges, the air testing team (above) strapped a particulate sensor to a laptop and took it out to grab samples and talk to local residents about air monitoring. Their conversations revealed that there's a wide spectrum of perceptions about air and air quality. Their ultimate goal is to provide citizens with ways to regain agency over their air. Inspired by Detroit's vibrant graffiti culture, they have identified opportunities for both data collection and creative expression that make the invisible visible, via tools both to collect data and "tag" pollution. The lighting team, (De)Constructing Light, (above) discovered through talking to residents that light and community are closely related. Without communication, a neighborhood is just a neighborhood; light is a pure form of communication that helps us form community and make connections. Offering people ways to reshape and personalize the things they care about and use every day makes them care about those things more. Educating residents about what's possible was an important first step, and more important than actually building a perfect light. In a workshop on Sunday at the Mt. Elliott Makerspace, the team showed a group of kids that finished objects are not always finished—we can take things apart and reuse them in different, and sometimes more useful, ways. They led the workshop through a project that involved taking apart and re-imagining a flashlight, teaching participants that disassembling an object can be a metaphor for empowerment. 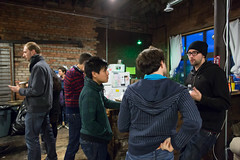 The compost team, Black Gold, (above) is educating and enabling people about home worm composting. 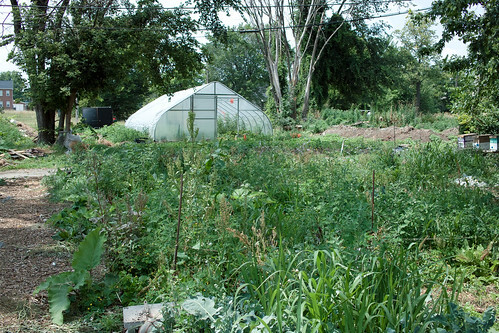 They're also making available a community-wide composting system. The team decided use worms for a few reasons: they create usable compost as much as six times faster than aerobic composting, and they generate higher-quality compost; in addition, using worms for composting eliminates the need to flip compost, one of the more labor-intensive and difficult aspects of aerobic composting. Finally, the worms self-perpetuate, so they can be shared with friends and neighbors indefinitely. 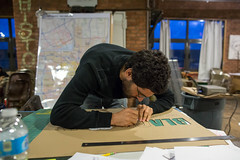 The community team (above) is creating a network of billboards and interactive in-store displays in community hubs around Detroit, the Detroit Digital Board or D-board. The D-board will allow for richer information sharing within and across communities, by showcasing local events, community resources, and positive messages in public spaces. This project will allow Detroiters to inform themselves, changing the urban environment by conveying positive, community-focused information. 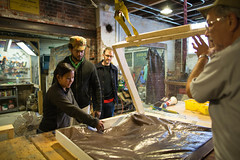 The soil team (above) has created CitySoil: Detroit, a three-part plan to engage, educate, and share information about how to test soil and improve soil performance. They're working on ways to educate residents about what questions to ask about their soil; how to test the soil and what to look for in the results; and how to share this information with neighbors and other residents through tools like interactive maps and data visualizations. This summer we started talking about forming a group for innovators, and decided to begin the initiative with a hands-on project in Detroit. We knew that things would grow and change, and that we'd need to be agile and flexible (two qualities important to fostering innovation). Members of the Media Lab team have made a few trips to Detroit, and a group of Detroiters came here to the Lab to see what we're about on our home turf. This event has changed from what we'd originally envisioned, and we're glad of that—we think that now it more accurately reflects the kind of work already being done in Detroit, as well as plays to the strengths of the Lab and our member company and event co-producer IDEO. This work builds upon Knight Foundation's already existing commitment to foster information sharing and engagement in Detroit communities. Together, the Media Lab, IDEO, and Knight are excited to work on a series of design challenges with a mix of the Lab’s own special alchemical blend of uniqueness, impact, and magic. So what's next? We're heading back to Detroit October 5-8 for our first meeting, and to get things started we brainstormed with and listened to our new Detroit friends to come up with a few starting-off points that fit with the needs and concerns in their communities. We framed some challenges that will, we hope, empower all of us and create community. We'll have one team per challenge, with each team made up of Detroiters + Media Labbers + IDEO designers + expert friends + industry innovators. 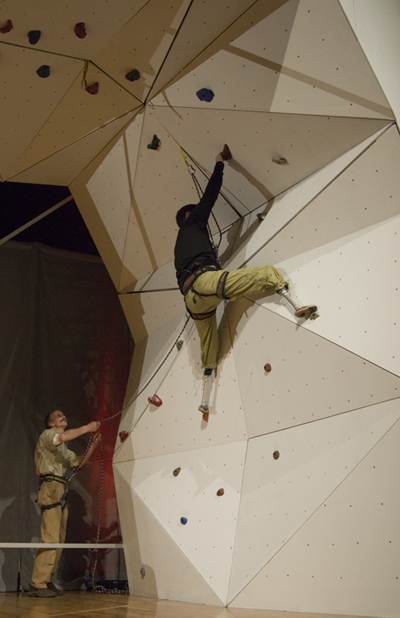 We envision the challenges as jumping-off points for the teams. Some might end up with a totally different result than the challenge, but the important thing is to look, listen, and learn from our surroundings and collaborators. We'll all be blogging, tweeting, and posting while we're in Detroit and after we get home, so that others can see what we're working on, meet our Detroit collaborators, and join the conversation. Our hashtag will be #IGDetroit. We’ll check back in again with a blog post before we head to Detroit, to share more details about some of the team members. 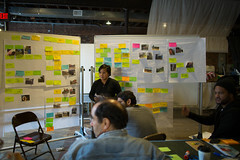 The Media Lab through Your Lens: Enter Our Photo Contest and Meet Joi Ito! The Media Lab’s reach spans the entire globe thanks to our professors, students, alumni, and spin-off companies. We’re always excited to see our researchers developing technologies that promise to fundamentally transform our most basic notions of human capabilities. To celebrate the many projects that come out of the Media Lab, we present The Media Lab through Your Lens photo contest. Who can enter? Anyone who is not connected to the Media Lab (past or present). How do I enter? 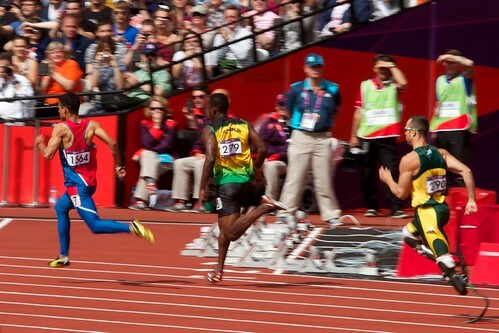 Send your photo(s) to contest [at] media.mit.edu and you’ll be entered, pending your photo’s adherence to the rules. We encourage you to send as many pictures as you like, but your name will only be entered once. Make sure to include your full name and email address, and how you would like the photo to be credited. So what are you waiting for? Grab your camera, smartphone, or tablet and start sending us photos! You can check out our Facebook and Pinterest pages periodically throughout the contest to see a collection of the photos submitted. We can’t wait to see the Media Lab through your eyes! *All photos submitted for the contest become property of the Media Lab and as such can be distributed via Media Lab web pages and social channels. The MIT Media Lab has the right to disqualify any entrants submitting pictures that do not meet the guidelines or are stolen property. Much of the discussion about educational technology these days focuses on new ways to deliver instruction, through online videos and online courses. In our Lifelong Kindergarten research group at the Media Lab, we have a very different approach to education and learning, developing technologies not to deliver instruction but to open opportunities for people to create, collaborate, experiment, and express themselves. With our Scratch programming software, for example, young people can create their own interactive stories, games, animations, and simulations, then share their creations with one another online. In the process, young people learn to think creatively, reason systematically, and work collaboratively – essential skills in today’s society. 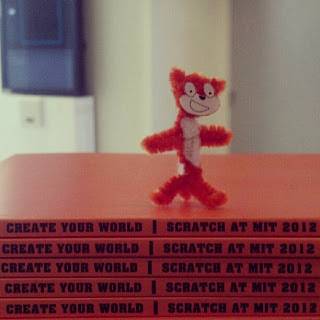 Last week, we had an opportunity to see how this learning approach is taking root in different parts of the world, as we hosted our third Scratch@MIT conference. 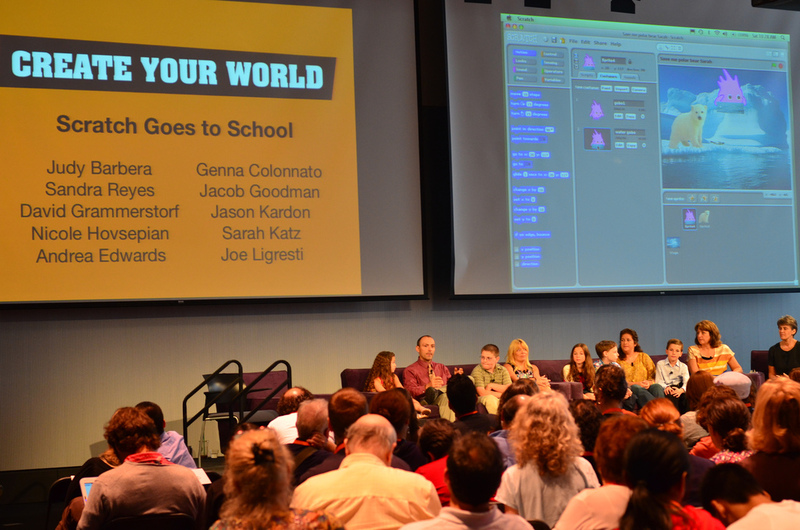 More than 400 educators, researchers, and developers from 31 countries came to the Media Lab for four days to share stories, plans, and visions about Scratch. Connecting with ideas. In one of the keynote sessions, five educators and five third-grade students from a school district in New York demonstrated how they are using Scratch as part of a “computational thinking” curriculum unit, highlighting how programming activities can provide opportunities for students to engage with important math, science, and engineering ideas. Students weren’t just learning Scratch; they were learning with Scratch. Connecting with interests. In session after session, it was clear that the best Scratch learning experiences happen when people have an opportunity to build on their own interests. There were examples of young people using Scratch to create simulations of environmental issues affecting their communities, games featuring characters from their favorite books, and animated stories with original soundtracks. Connecting with the physical world. Increasingly, Scratch projects are stretching off the computer screen, connecting to sensors, motors, and other devices in the physical world. A researcher from Ireland demonstrated a way to use Microsoft Kinect to control Scratch projects with body gestures, while researchers from Japan introduced a low-cost sensor board for controlling Scratch projects. Connecting with people. 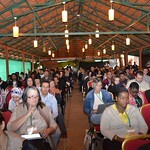 Many sessions at the conference highlighted the social nature of learning. Some presentations described how young people in different countries are collaborating on projects through the Scratch online community. 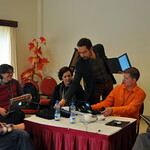 Other presentations showed how educators are creating Scratch sub-communities within their countries. Although the Scratch@MIT conference happens only once every two years, our research group is always working to nurture, sustain, and extend all of these connections. The ScratchEd website enables educators around the world to share stories, exchange resources, and connect with one another. And later this year, our group will launch a new generation of Scratch, called Scratch 2.0, that will enable people to create projects directly in the web browser, opening new opportunities for creativity and collaboration with Scratch. Mitch Resnick is Professor of Learning Research and Director of the Lifelong Kindergarten research group at the MIT Media Lab. Karen Brennan, a PhD student in the Lifelong Kindergarten group, chaired the organizing committee for the Scratch@MIT conference. At the Media Lab, I’ve been working on principles that define our DNA and our world view. One of these is Compasses Over Maps. The idea is that in a world of massive complexity, speed, and diversity, the cost of mapping and planning details often exceeds the cost of just doing something–and the maps are often wrong. We experienced this firsthand during our trip to Detroit over the weekend. In early July, we announced a new initiative: The Innovators Guild. Our idea was to bring the best and brightest chief innovation officers on a field trip to work together with our students, faculty, and local innovators in a community and do an impactful hackathon. The plan was to do a one-time thing in a bunch of cities around different themes. Detroit was the first on our list. The general idea—the compass heading—was right, but the details were wrong in many ways. We knew we had to go in to listen, be humble, and not try to be top down and prescriptive, but we were surprised nonetheless. But before we innovated on anything, we needed to listen and build trust. We realized immediately that to do that we had to think long term and in a sustainable way, while working closely with the people on the ground. 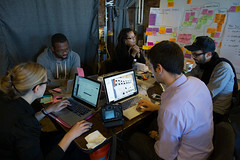 This wouldn’t be just a three-day hackathon, but rather a long-term project connecting us to a network of networks in Detroit. 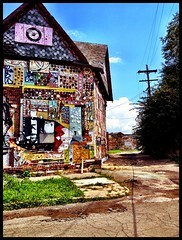 We were amazed and humbled by the complexity of Detroit’s various networks, as well as their tensions and cohesion. Once we started making individual connections, we found that beneath the skepticism was a passion and cautious excitement. We discovered that there were definitely connections that could be cultivated into real relationships where we would learn, share, build, and grow together. One of these relationships is with Jeff Sturges, our guide on the ground in Detroit. Jeff runs the Mt. 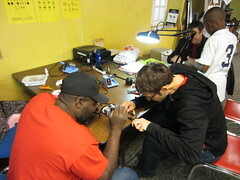 Elliott Makerspace in the basement of Church of the Messiah, and is just the first of many like-minded, creative individuals we anticipate inviting to the Media Lab as part of an ongoing collaboration. 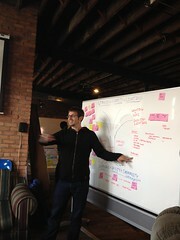 We are super excited about the future of the Innovators Guild and our engagement in Detroit. And while our map was wrong, we listened and pivoted to this new plan, which I think is even more exciting. We returned to Boston completely energized and inspired, and can’t wait to go back to Detroit with more of our team to see what kind of work we can do with our new friends. Since I joined the Media Lab a year ago, I’ve been constantly amazed and amused by the tribe of iconoclasts, risk-takers, and renegades here who look to the edges for new ideas. On a walk through the Lab buildings, you'll see–among other things–robotic ankles, smart wallpaper, an interactive ping-pong table, fuzzy robots, and a model of a folding electric car. 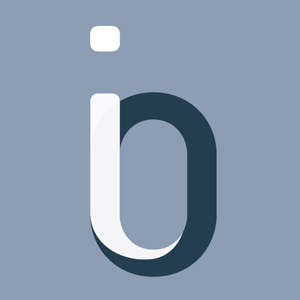 We call ourselves antidisciplinary, and we’d like to extend this way of thinking and working into a program we've named the Innovators Guild, aimed at bringing together like-minded trailblazers. One thing I've noticed is that the people in organizations who are the most responsible for innovation are frequently working alone–and they're lonely. When you're the person who walks the tightrope between risk and results day in and day out, you need colleagues to bounce ideas off and peers to give a simple reality check: to tell you whether an idea is awesome–or simply crazy. I'm envisioning the Innovators Guild as a cohort for CIOs and other innovators, a cross-sector network that can work together to make a challenging job a little less lonely, and a lot more fun. We talked about the idea this morning at the Aspen Ideas Festival, and we’re still developing the details. 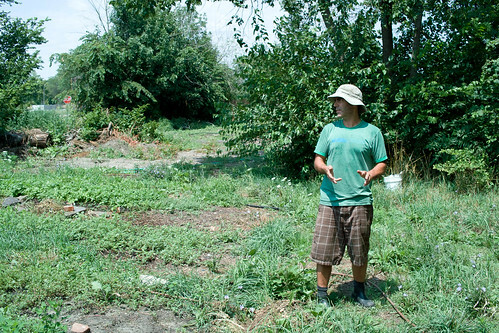 As a first step, the Lab has teamed up with Knight Foundation (who will be filming a documentary of this project), and IDEO for our first hands-on activity, an on-the-ground project in Detroit, where we'll work with local innovators to hack out a new possible solution for inner-city food production and think about how to create sustainable systems. In the process, we expect to find new inspiration, make new connections, and engage in hands-on experiences to speed innovation. John Seely Brown, the former head of Xerox PARC and John Gage, former Chief Scientist of Sun Microsystems are the two first recruits for the guild who will be joining us on this trip. We’ll be sharing more details about the Guild in the fall. Stay tuned! 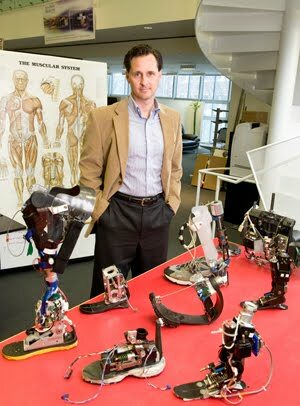 I am often referred to as a bionic man because I have two "smart" lower-leg prostheses that perform like biological legs–and in certain instances, outperform biological legs. As my "natural" body ages, my legs don't; I'm always ready for an upgrade. But the technology that has given me these legs represents just the tip of the iceberg of what may be possible in an era where design promises to elegantly merge nature with technology. Imagine a world where we finally know as much about our natural selves as the synthetic materials we create–a world devoid of instruction manuals, where nature and technology are so seamlessly intertwined that we cannot tell where one ends and the other begins. Next Wednesday, April 25, the Media Lab will be bringing together an incredible group of innovative thinkers, including Craig Venter, Reid Hoffman, Marvin Minsky, John Maeda, and Paola Antonelli for a day-long exploration that just might forever change your thinking about what is natural and what is not. And what the future has in store for us. Hugh Herr is associate professor of media arts and sciences at the MIT Media Lab, where he leads the Biomechatronics research group. The energy level here at the Media Lab is growing as we make the final push to get everything ready for next week's event–both for our invited guests and our virtual attendees. We thought that you might like to hear a little from one of our invited speakers, LinkedIn's Reid Hoffman. When Reid was here recently as a part of our Media Lab Conversations series, we asked him for his thoughts on a question posed by next week's emcee, John Hockenberry, about networks and connections and what they can tell us about big ideas. "There's more to immersion than 3D, including peripheral vision, sound, etc. Most viewers report that our Infinity-by-Nine system (which appears to be an "infinitely" wide TV screen) is more immersive than a standard 3D TV viewing experience." Language shapes our intellectual grasp of Nature, but is over-coloured by Technological metaphors. How to re-language language? "Language is practically nothing but metaphor. See Lakoff's "Metaphors We Live By." Worried that technology metaphors will somehow corrupt language? Don't be. In every era, the same concerns, and you know what? In time, people are always good at putting things into their proper perspective." Is the technology changing our nature, leading us to an another evolution step? "Until Darwin, evolution had no plan. No intelligent Designer. (Except for some breeders of plants and animals.) Now we have crossed a threshold of knowledge–and can begin to design genetic modifications. So now, all the rules of the game can be changed!" "Going through tech driven 'evolutionary step'—more about systems and networks—less about singularity IMHO." What about human behavior inclines us surrender privacy to technology? "I think human behavior around privacy will change once we feel more pain." Learn more about the relationship between nature and technology via webcast next week at our spring event. If you missed Wednesday's Media Lab Conversation between Joi Ito and LinkedIn's Reid Hoffman, never fear! It's available to watch as an archived webcast. 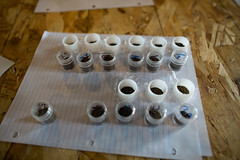 In addition, graduate student Matt Stempeck has provided a detailed transcript of the talk. 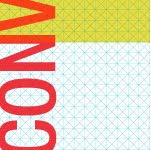 The schedule of upcoming Conversations includes Tim O'Reilly (4/18), Howard Rheingold (5/10), and more TBA. 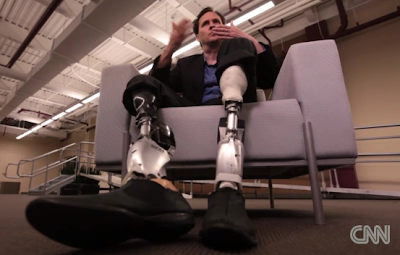 Hugh Herr: "I'm just in love with–enamored with–the design of the human body; its elegance. We steal from the cookie jar of nature and we apply that, and we build synthetic constructs that emulate that functionality." Here's a preview of one of the topics of our April event, Inside Out, via Sanjay Gupta's interview with Media Lab professor Hugh Herr. Hugh discusses his group's work on "bionic" prosthetics in this CNN video (click the image for the video and full article on CNN). Archived Webcast: Wadah Khanfar, "One Year After Mubarak"
In addition, graduate student Nathan Matias of the Center for Civic Media contributed a summary of the event to the Center's blog. 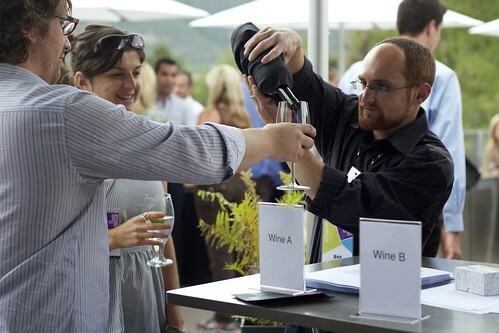 I am excited to tell everyone about a change we’re making for our spring 2012 event in April. For the first time, the Media Lab will make publicly available our Lab research updates. These snapshots of Media Lab research are one of the best ways–if not the best way–to get a bird’s eye overview of what I’ve begun to call the Media Lab Network. This Network has lots of nodes—people, projects, events. There’s a lot going on here and it’s often difficult to navigate, especially in a big-picture way, but it’s all interrelated, via collaboration, co-location, similar philosophies, or the shared excitement of the researchers—it's the Media Lab Network. Since I came on board as Lab director last September, I’ve been focusing on casting our gaze outward. We’ve been pulling up the blinds so we can see out—and of equal (if not more) importance—so others can see in. We will continue iterating and extending this openness with each new project and event, and as we ramp up to the spring event, we’ll be posting more items here as a preview to what will be going on over those three days. While the physical meeting itself is by invite only, all the talks and panels will be webcast for everyone to watch. I hope you’ll watch some or all of them, and share your thoughts and comments with us on Twitter and Facebook, or as comments here. Lawrence Lessig sees the American people as a sleeping giant. It's OK to sleep—in general, we'd all rather focus on things other than politics. But, Lessig argues, there are times when our political system is so broken, we must awaken and flex the powers granted to us by our Constitution—now is one of those times. The first event in the spring Media Lab Conversations series featured a conversation between Media Lab director Joi Ito and lawyer, professor, author, and reformer Lawrence Lessig. Joi and Larry met in Japan in 2002, and their paths crossed a number of times over the following years as each took on campaigns for creative culture and against state corruption. Lessig most recently shifted to focus entirely on fighting corruption, despite his fame in intellectual property law. He begins his talk with an apology for distracting us from our research. But he's here to recruit us, to distract us from our machines for a moment, because it's critical that people like us pay attention and contribute to the solution of an extraordinary problem. Every 100 years or so, society finds itself at a point where even the geniuses are forced to confront the messy world of politics—such as when the physicists working on atomic power and other wonders had to stop their work and confront fascism. Lessig says we're at a similar place now, where scientists must look up from pure research and take action. Even further back in time, at the Constitutional Convention, Congress created a clause (Article 1, Section 9) outlawing gifts to officials, which stemmed from a fear of potential dependency between the officials and gift-givers. Yet in July of last year, Rasmussen reported that 46% of Americans believe that most in Congress are corrupt. But Lessig disagrees with this—the institution isn't filled with Rod Blagojeviches. He believes that it's filled with people who came to Washington for a public purpose. The framers of the Constitution gave us a republic, by which they meant a representative democracy, with a branch of government dependent upon the people alone. The model described in the Constitution places the people as puppeteer and Congress as marionette, with the people pulling the strings. But actually, it's campaign funders pulling the strings. Members of Congress spend between 30-70% of their time raising money to get back into Congress, or to get their party back in power. This is corruption. It's not the corruption of cash in brown paper bags, or of Rod Blagojevich selling access. It's corruption of dependence, and a corruption of the framers' intent that the Congress be dependent on the people. Political scientists have trouble estimating the effect of money on policy. People such as former FEC Commissioner Brad Smith spin to suggest that there is no evidence of corruption. Lessig argues that a lack of evidence does not suggest an absence of evidence. Ask the public. Across party lines, Americans believe that money buys results in Congress (71-81%). A recent ABC survey found that only 9% of Americans approve of Congress. More Americans supported the British Crown at the time of the American Revolution. Rock the Vote has found that youth voting rates in 2010 were deflated by the expectation that a vote isn't enough to make a difference in a corrupt system. The same reason is given by voters of all age groups. Regardless of the issue, from healthcare to global warming to financial reform, reform is essential. The system of government where the funders control Congress will systematically block change as long as it's in place. Lessig beseeches us—his rational MIT audience—to realize that our current political system will block reason within the halls of Congress, no matter the issue. We are the 1% of people whose very occupation is the pursuit of reason. If the problem is systemic, and not just a matter of some corrupt people, then the solution is to give Congress a way to fund their campaigns without Faust. They need a way to behave that doesn't involve selling the country's future each financial quarter. Should citizens fund our campaigns? Or should foreign nationals and corporations fund our campaigns? The Constitution is pretty clear on this. As of now, a miniscule percentage of Americans privately funds our campaigns. While the framers of our Constitution worked extremely hard to make all voters equal on Election Day, our current system allows the tiniest slice of the wealthiest among us to gain the most influence. One alternative is government-funded elections, where the government dispenses funds. But people complain that their money is used to subsidize speech they don't believe in. And, as in other government funding systems, it becomes bloated. Lessig proposes a mix between private and government funding. It's a mix we see in some states, where small donations are amplified by public matching funds. Arizona, Maine, and Connecticut have such systems in place. In 2010, the House came close to passing the Fair Elections Now Act. Lessig proposes what he calls the Grant & Franklin plan. It's based on the fact that each of us contributes at least $50 (the bill featuring Ulysses S. Grant) to the federal treasury. If we rebated that $50 in form of a democracy voucher, candidates could run entirely on these funds. We could match democracy vouchers with another $50 (making it $100, featuring Benjamin Franklin). This would amount to a campaign funding system with $7 billion, multiple times the $1.8 billion spent in private donations in 2010. Such a plan would remove a source of incessant cynicism. Would that be enough, given the SuperPACs out there? Every incumbent is now terrified that, 30 days before their election, some Super PAC will come in and drop millions of dollars in advertising against them. Candidates feel that they need some form of Super PAC insurance, so that when a (money) bomb is dropped on one side, another (money) bomb gets dropped to neutralize it. You get insurance by paying premiums in advance. Super PACs have succeeded in aligning votes with mere promises of insurance—they actually call members of Congress with scripts saying things like "We need you to support us 80% of the time for us to support you." A plan like Lessig's wouldn't ban independent political expenditures, but it would limit them within 90 days of an election. If we had these two features, Lessig contends that it'd make trust in our institutions possible again. But is all of this possible? It's easy to see a problem, and not so difficult to see a solution, but can be quite difficult to enact a solution. Congressman Jim Cooper, of Tennessee, described Capitol Hill as "a farm league for K Street." Many in Congress are focused on their lives after government, as lobbyists. Fifty percent of the Senate and forty-two percent of the House left to become lobbyists and cash in on their contacts and experience. Lessig just published One Way Forward to chart the course ahead. He sees the primary divide in American politics as not between left and right, but between inside and outside. Outsiders have become so disgusted with how things are, they've put aside their lives for a moment to try and find an answer. The year 1998 saw Americans rally behind MoveOn.org. In 2009, the Tea Party took the spotlight, followed by Occupy in 2011. These waves are building over time. The challenge, Lessig argues, is for these waves to have some awareness of their combined potential, of their latent power. Right now, they're extremely passionate, but also polarized. We should look at each of these waves and see the cross-partisan potential they have to move and act together, even if right now there's very low recognition of that potential. That's what we need to change. This giant—the people—is sleeping most of the time. It must be awakened. We must stand on common ground, not because we have a common end, but to recognize the common enemy of corruption. Lessig doesn't try to predict the complete arc of this movement. But we do need to engage more ordinary citizens in the practice of teaching. Rootstrikers.org is recruiting citizens who will teach fellow citizens about the connection between the things they care about and the root of it, corruption. If Thoreau's math found that there are 1,000 striking at the branches for every 1 hitting the root, we'll need 311,000 teachers for all 3.11 million Americans. That's their goal. There's corruption happening around the world, and around the world, people are rising up in fury against it. Starting this week, Lessig's asking people to pledge to end corruption, and to specify how they'll do so. The branding resembles the various Creative Commons licenses. Lessig plays the audio from the Exxon Valdez's return transmission alerting the dispatcher of the collision and ensuing oil leak. The captain escaped conviction, but there's little doubt to many observers that he was drunk. There was no doubt, however, that he had a history of problems with alcohol; there are records of his driver's license being revoked for DUIs. At the time he crashed a supertanker, he was not allowed to drive a VW Beetle on the highway. But consider everyone else around him—all the people who did nothing while a drunk was driving a supertanker. We are those people. We have many problems today. And yet our institutions are distracted, too busy to focus. And so are we, too busy doing the real work that produces value and contributes to the world, too busy to focus on this critical problem and give it the serious attention it needs. So who's to blame? It's too easy to point to the evil people. They have their share of responsibility. It's the good people, the decent people, the most privileged, who have the obligation to fix this. Corruption is permitted by the passivity of the privileged. A republic depends on the people alone. We have lost our republic, and it's time for all of us to act to get it back. A summary of the question and answer period is available on the Center for Civic Media's blog. Matt Stempeck is a research assistant at the Center for Civic Media at MIT, and former new media director at Americans for Campaign Reform, where he worked in a broad coalition with Rootstrikers.